Hungarian Uprising: From the Power of a Symbol to a Symbol of Power? What purposes does the remembrance of 1956 serve in Hungary today? 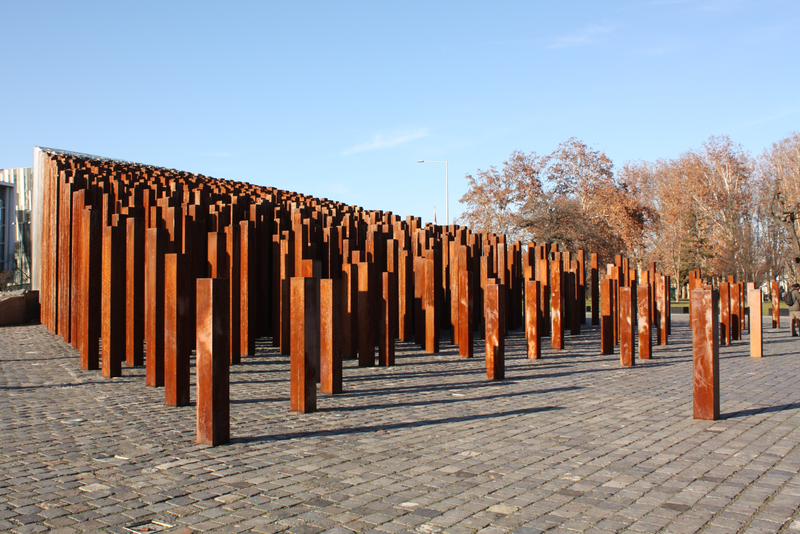 A commentary about Hungarian politics of memory. The Hungarian Revolution of 1956 might legitimately serve as a symbol of national consensus in a polarised society to the extent that the revolutionaries’ key demands – such as an end to violent and arbitrary rule and foreign military occupation, or the restoration and future guarantees of basic freedoms and greater independence – were shared by practically all participants. At the same time, 1956 was a multifaceted event with diverse actors, phases, ambitions and strategies. The days of the revolution lasted just long enough for some of this plurality to become visible, but they were cut short too soon for the relationship between the various forces to really play out. No one can have a clear sense of what would have followed if the Soviet Army had not crushed the unfolding revolution in early November 1956. What we know for certain is that in recent decades its guiding ideas, after having been demonised for many years, have often been declared triumphant, not least by those in power. The remembrance of 1956 from the days of the revolution to the present has clearly been characterised more by ruptures than by continuities: the meaning of these events has been reinterpreted multiple times, most significantly around 1989. The year 1989 not only marked the crumbling of a falsified (counterrevolutionary) version of 1956, but an end to any official interpretation of Hungary’s history in the preceding decades as such. If the 1980s were about the struggle for the right to remember 1956 and to bring about its due recognition (which were termed “historical justice” at the time), the post-1989 decades were already about the freedom to remember the revolution as you or members of your family experienced it (or any other way you happen to prefer). 1956 may have been widely seen as a foundational event for Hungarian post-communist democracy, but no single interpretation of it has achieved canonical status. While left-wing and liberal forces shied away from a pro-active politics of history, conservatives and right-wing populists had little use for the actual historical context, complexity and unfolding of this multifaceted revolution. The year 1956 has remained a contested symbol: the new liberal democracy after 1989 certainly enabled a plethora of excellent new research into its history, but this also led to rather persistent interpretative differences. Depending on the political values one holds, different actors of the revolutionary drama may be foregrounded in order to shift the emphasis from direct democracy to the multiparty system of representative democracy, or to national independence and anti-communism. 1989 did not put an end to the heavy politicisation of such remembrance either, as the street clashes in 2006 were to reveal with particular clarity. Following damaging revelations about then-recently elected Prime Minister Ferenc Gyurcsány on the 50th anniversary of the revolution, the Hungarian right rebelled in the name of an unfinished anti-communist agenda. The afterlife of the revolution in the early 21st century was thus also about radical elements attaching new importance to its memory and abusing it for their contemporary purposes. The moot questions therefore are as follows: What purposes does the remembrance of 1956 serve in Hungary today? How has its commemoration been organised after six decades, and what political ideas and values have been promulgated in the process? The largely Fidesz-controlled Hungarian state has clearly endorsed the remembrance of 1956 and devoted significant resources to holding a year of remembrance (“1956-os emlékév”). Such a commemoration means an elaborate series of events within the Carpathian basin, i.e. in Hungary and its neighbouring countries with substantial Hungarian populations, while covering almost the entire globe. Its overall budget exceeds HUF 13 billion, or circa EUR 42 million – a generous sum which sharply contrasts with the substantially reduced budget of the Institute for the History of the 1956 Hungarian Revolution. Thirty jury members have decided in favour of supporting 957 funding applicants, or slightly more than half of the total. The generously endowed initiative is titled “1956–2016. The Year of Hungarian Freedom”, and can be seen as merely the latest in a series of such initiatives, which in previous years have addressed topics such as the Holocaust and the Gulag. The declared primary purpose of such successions of events may be commemorative, but they can easily serve as major occasions for reshaping the politics of history. After all, years of remembrance are for the politics of history what electoral campaigns are for politics, both aiming to shape perception through attractive slogans. What is more, it is not only the case that political appointees predominate among those made responsible for the current year of commemoration, but that these are predominantly Fidesz-affiliated politicians – from the chief patrons to the president all the way to the so-called permanent members of the remembrance committee. It is no other than Mária Schmidt, already the recipient of more appointments and resources from the Hungarian state than any other historian by quite a margin, who has again been assigned a central role as co-president and the chief public communicator of the year. Schmidt has served as the coordinator of state-funded megaprojects on the Holocaust, World War I and 1956 within the last three years. This amounts to an unprecedented level of centralisation and personalisation of power in the field of contemporary history. A historians’ working group may have been formed as part of the organisation responsible for the current year of 1956 remembrance, but its exact function has remained difficult to ascertain. In any case, the official discourse around the ongoing year of remembrance seems to have had little to do with expert discussions. The leading questions young people are supposed to confront during the year of remembrance are phrased in a rather general way: how did the dictatorship operate and why did the people, especially young people, choose to revolt against it? The chief aims of the year are for current generations to learn to appreciate the heroism of the participants and to develop greater pride in the history of their country. This may sound like a rather traditional agenda of valorising historical actors for the sake of fostering a conservatively oriented sense of patriotism. The emphasis, however, is also very much on modern techniques, on translating key events of 1956 into contemporary language and on making them appear hip through the use of spectacular visuals. The year of commemoration thus seems to largely continue the tradition of historical representation introduced to the country by the House of Terror back in 2002, i.e. rather minimal levels of factual information and explicit historical argumentation accompanied by heavy doses of visual, aural and ultimately emotional manipulation. The emphases of the current year of remembrance have been placed on the core values of freedom, national independence and the morality of confronting evil. Little attention has been paid to seemingly more prosaic acts of cooperation, solidarity and reform, or to the re-emergence of a vibrant multiparty system in the days of the revolution. An intriguing question in the current political context has been how the enemy of Hungarian national independence would be identified and the extent to which Soviet-Russian imperialism would be highlighted. For his part, Prime Minister Viktor Orbán has preferred to draw spurious analogies between the earlier ambitions of Moscow and the current ambitions of Brussels. Second, the stories of refugees from Hungary, who played such a central role in preserving the memory of the revolution before 1989, have received more limited attention this time around. After all, a major point of current international contention concerns Hungary’s treatment of refugees, and the last thing the state wanted was to openly declare its hypocrisy. Yet although such an admission was avoided, the almost complete lack of prominent participants from abroad even in the main commemorative event on 23 October (the single exception being Polish President Andrzej Duda) has cast a spotlight on the refusal of practically all leading European politicians to endorse the instrumentalisation of 1956 in the service of the government’s current “freedom struggle” for greater national sovereignty and against deeper European cooperation. After 60 years, 1956 is at the brink of passing from being a subject of communicative memory in Hungarian society to becoming exclusively one of cultural memory; the era when eye witnesses with their subjective-objective recollections could heavily influence the terms of public debate about the revolution is gradually coming to an end. Hopefully, the consequences will be greater analytical distance, more proper historical contextualisation and growing reflexivity in place of continued attempts to foster identification with the revolution and the management of supposedly collective memories for contemporary political and identitarian purposes. Hungary’s official representatives may not show many signs of intending to foster a more deliberative and rational culture around the country’s recent history, however. Indeed, its current rulers may simply be more interested in turning the power of the 1956 symbol into a symbol of their power. Yet among the essential elements of the complex and inspiring story of 1956 are spontaneous mass mobilisation and the rejection of propagandistic lies, the sudden erosion of the fear to protest and the courageous expression of justified grievances, and, last but certainly not least, the self-organisation of society from below. It is therefore conceivable that, by opening spaces for the public discussion of 1956 and its high ideals, the year of remembrance might once again produce unintended consequences for those in power, and fuel discussions that do not reinforce right-wing hegemony but instead foster re-democratisation. The ideals of 1956 may not have triumphed, but that only makes the revolution an even more relevant source of inspiration today. October 23 marks the 60th anniversary of the 1956 Hungarian uprising. Our dossier reflects on the relevance of this historical event for present-day Hungarian society and politics. In October 1956, Hungarian citizens staged a popular uprising to protest against the repressive policies of the Communist Party and against the country’s occupation by the Soviet Army. On 11 November 1956, Soviet forces quashed the last pockets of armed resistance in the capital city.